If you’re into photography, you’ll know that Photokina is about to begin over in Cologne, Germany. Canon has been rumored to be releasing a brand new entry-level full frame DSLR this year at Photokina, and the 6D is the brand new body that will be fulfilling said rumors. 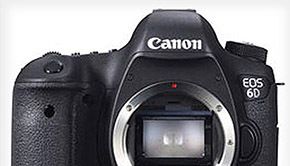 The EOS 6D is a mid-sized DSLR that fits between the 7D and the 5D mark III. It’s priced at $2099 which fits right between the prices of the aforementioned bodies and competes very closely with Nikon’s latest release, the D600. The 6D features a newly designed sensor with an effective resolution of 20.2 megapixels. Images and videos will be processed on the recently released Digic 5+ which is also found in the 5D mark III and the 1Dx. Similar to the 5D mark III, this new body also has an ISO range of 100 – 25600 in 1/3 stops, and expands to 51200 & 102400. It also features the same video functionality with 1080p at 24&30 fps and 720p at 60fps. Unlike the 5D mark III, the 6D can only shoot at 4.5 fps continuously compared to the 6 fps the 5D can achieve. It also doesn’t have any CF card slot, so you’ll be restricted to using SD/SDHC/SDXC with this new body. One thing most users will either like or hate is the new AF system. While it is better than the 9 point AF system in the 5D mark II, at 11 points, it’s far less than the mark III which has 61 +41 cross type. Overall the Canon 6D seems like the perfect entry-level DSLR for users looking to upgrade their cropped sensor cameras but don’t wish to fork out the money for a 5D mark III. Even with the low number of AF points, this is a better option than the older 5D mark II which is priced similarly after recent price cuts. And while there hasn’t been any hands-on coverage with the new body, I’m sure Canon has seriously improved the AF system from that in the 5D mark II. I would assume this camera will be very popular with the independent filmmaking community as it should have similar performance to the 5D mark III minus the photo related features most videographers won’t need. This is an exciting release from Canon, and many of us will be very interested in seeing how it fares in comparison to the 5D mark III in real life situations.